Hi Everyone! Welcome back to another blog brought to you by Eureka Crystal Beads. By now I’m sure you’ve seen, absolutely everywhere, these super fun leather wrap bracelets… Have you tried making one yet? They are so easy to make and a great project for any skill level! Another great aspect of them is that you can work in as much or as little of a pattern as you like – meaning – repeat the same bead sequence over the length of your bracelet for one look OR go wild with your bead selection and end up with something wonderfully eclectic! In this blog I’m going to give you some DESIGN TIPS for these great bracelets. If you’ve never made one of them before and you need the beginner ins and outs, please check out the VIDEO TUTORIAL I did on the Eureka Crystal Beads YouTube channel first for the basics! In addition, I also used 6lb FireLine, size 12 beading needles, and Beaders Wax. Measure the length of leather cord needed to wrap the desired number of times around your wrist and then double it since we’ll be starting in the center of the cord and using both ends. Additionally, add on another 6 inches or so to account for the cord needed to form the beginning and ending knots as well as the loops to make it adjustable. For the basics of how to get the bracelet started, I again will direct you to the video tutorial I made (linked above) as this blog will focus more on design techniques. We’ll have a LEFT CORD and a RIGHT CORD. Your FireLine will always go through each bead (or each bead hole in a 2-hole bead) twice: once passing from left to right and again passing back right to left. When passing Left to Right, your FireLine will always be BELOW the Left and Right cords. When passing back Right to Left, your FireLine will always be ABOVE the Left and Right cord. DESIGN TIP 1: Create a TAPER. This is a nice and clean way to begin and end your bracelet. In my example, row 1 was made simply with (1) Toho size 11 glass seed bead. Row 2 used (1) 3mm Firepolish Czech glass bead, and row 3 used (2) size 11 seed beads. Then I jumped into using the larger beads. I also ended my bracelet using these same beads to taper down. 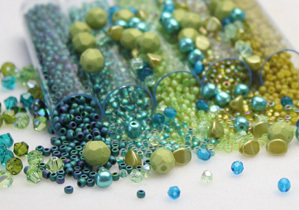 DESIGN TIP 2: Create a fun design using Toho size 15 glass seed beads and 3mm Firepolish Czech beads. Pictured, I did one row with: (2) seed beads and a 3mm Firepolish bead. The next row I used the same beads but loaded them on in the opposite order. I did a total of 4 rows like this, alternating, and they all interlocked nicely for a lovely look! You can see them pictured here in between the 2 rows of gold seed beads. Pass from Left to Right and, staying behind the cord, go through the top hole of your Mini-Tile. Catching yourself around your Right leather cord, pass back through the same top hole but stay above the 2 cords. Now, catch yourself around your Left cord and then pass through the second hole of the same Mini-Tile, staying below the cords. Catch yourself around your Right cord and pass back through the same (second) hole to the Left cord again. That’s it! Easy! Row 2: (1) Size 15 seed bead, (1) Button bead, (1) Size 15 seed bead. Repeat Rows 1-4 to continue this look! Pass 3, L-R: Pick up (1) new Superduo, pass through bottom hole of Superduo added in previous row, pick up (1) Superduo. Pass 7, L-R: Pick up (1) Size 11 seed bead, go through the bottom hole of the Superduo added in Pass 5, and pick up (1) Size 11 seed bead. Pass 8, R-L: Go back through same beads/holes as Pass 7. DONE!! All Finished!! I just love how fun and funky this bracelet looks with all of these beads and techniques all used together! Consider making your own – head on over to Eureka Crystal Beads for all of the materials needed! Exact colors I used are linked above together in the materials list. Next Post Fast Summer Project: The Dutchess Bracelet!